@Wanhua | Get Your Grub On! Food hunting did start getting on my nerves running through Ximending with a whole bunch of people who couldn’t agree on what to eat. We finally settled on a modern franchise looking beef noodle shop a couple of streets further in, away from the buzzin’ around the Red House. It even had aircon, how nifty. 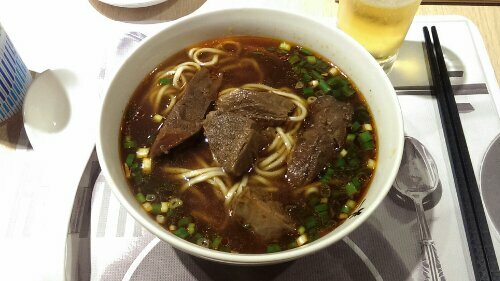 I didn’t change nothing and had my usual ‘Spicy Beef Noodles‘ (牛公館牛肉麵) again but what came to the table here wasn’t remotely close to matching any of the great bowls I had during the past few days. The broth itself was just okay but the noodles were pretty ordinary, starchy and didn’t add anything to the flavour and the meat was tough and dry. One bad bowl out of four is not a horrible hit rate but I was still disappointed knowing what kind of gems are around here and how our dinner could’ve turned out otherwise. Anyway staff was very friendly and the shop is also very conveniently located but unfortunately that won’t be enough to bring me back here again.